I enjoyed the last World of Sports break so much I decided to do another! I'm glad Target still had one box on the shelf. Well... it's not like these things are really flying off the shelves, but some random person could have gotten it out from under me. I'm excited to see all the different athletes that Upper Deck decided to include in this set! 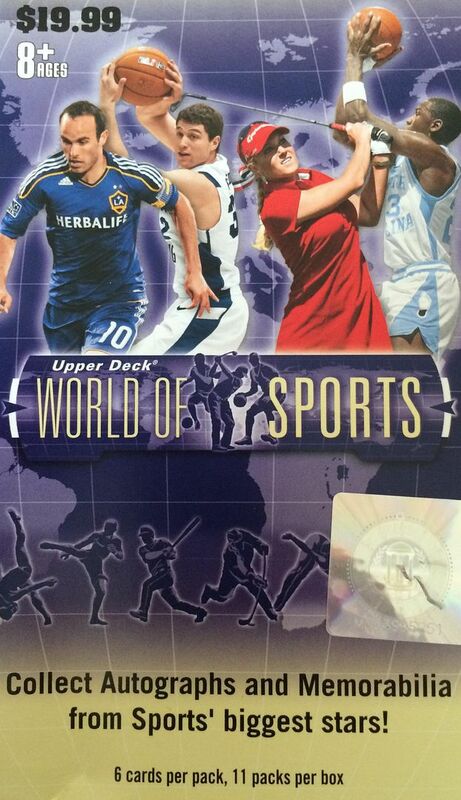 My last box of World of Sports had a lot of lacrosse in it. And I expect more of the same here. This release is just an updated version of the last one, so I don't expect there to be too much of a difference. I did enjoy seeing the big variety of athletes, and I'm glad to learn about stars that I don't know yet. I'm not sure what kind of inserts there are in this blaster. The 2010 blaster actually listed the odds on how difficult it was to pull various things - this blaster has no such odds. It just says that autographs and memorabilia cards are available to find. Last time I thought I was lucky because I was able to pull out a hit. I wonder if the same will hold true this time! I hope so! This was actually a pretty fun break despite a slow start. My first pack had a lot of players that I didn't know of, but as the break went on, I started to find more stars that I had heard of. The blaster actually contained quite a few known players by the end of it. I was able to pull out big name base cards like Colin Kaepernick, Barry Sanders, Scott Niedermayer, Mike Schmidt, Anfernee Hardaway, Dan Marino, and Adrian Peterson. Of course, none of these players had their pro uniforms on, but it was cool to get them nonetheless. World of Sports doesn't just include male athletes, female athletes can be found as well. I was pretty happy to get a Hope Solo base card as well as a Jeanette Lee base card. I didn't know who Jeanette Lee was when I first got her in my pack, but I later found out that they call her the Black Widow of pool. That's a pretty cool nickname. Despite going -5 in his game verses the Sharks this past week, it's always good to pull a Sid-the-Kid card. I like how the star hockey players are depicted in their Team Canada jerseys. Upper Deck has a deal with Team Canada, and they're using it to their full advantage! I love pulling Michael Jordan cards no matter what they are. He may be the most iconic sports figure ever. 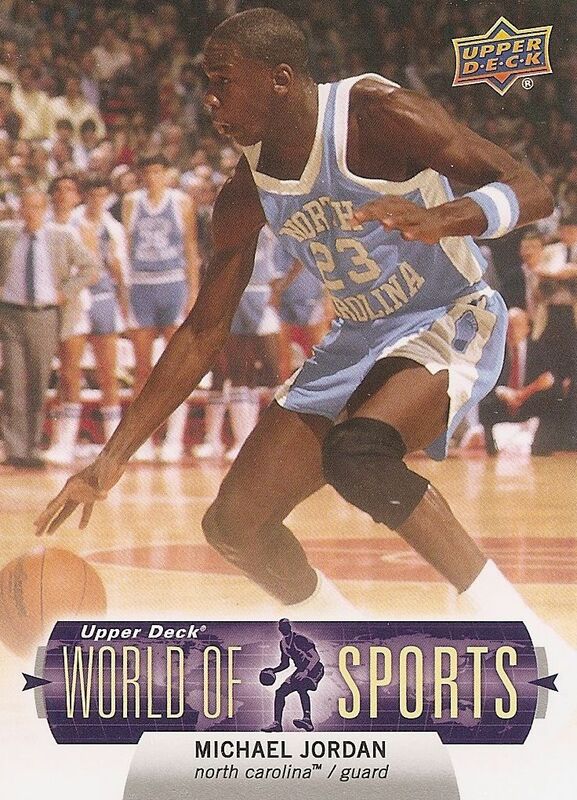 It's too bad UD lost the basketball license... there's just too much Jordan UNC stuff out there now. The baby blue is 'ok'... but I want to see him in red! I was very happy to be able to pull a hit out of this blaster. I thought I was going to get all base for a second there. 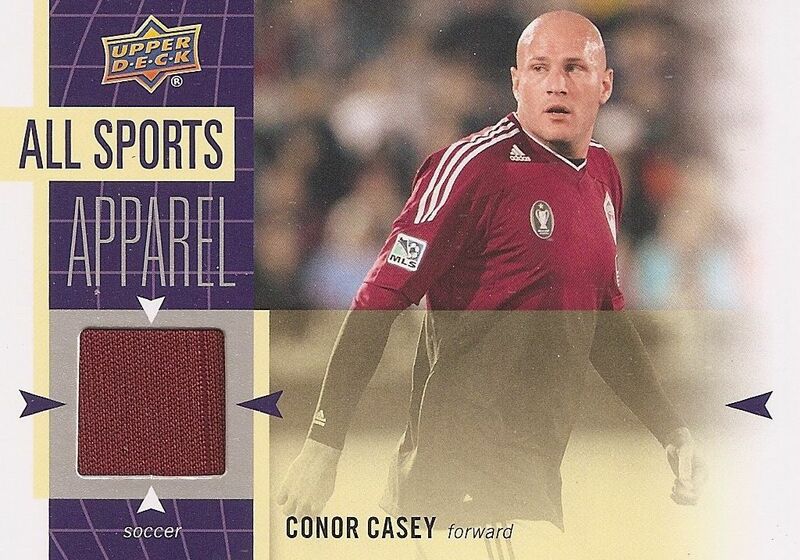 I have to admit I have no idea who Conor Casey is, but the swatch on the card is very nice, and I'll take some time to look him up after my review. Because of the hit, I think this break was a success. If I had gotten all base cards, I would have been disappointed even with getting some pretty nice stars in the base. The cards are decently nice, and each card has a nice little write-up of the player's accomplishments. I enjoyed the break, and I wouldn't hesitate to pick up another on eat this price!